So they don’t want us to call it Christmas anymore? The caravans did not travel following OnStar to their destination for a holiday. The angels did not announce glad tidings of vacation time and great shopping discounts. 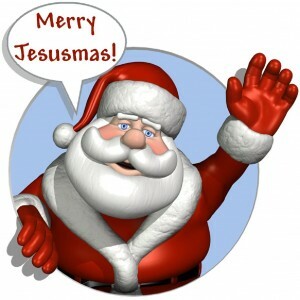 All right then, I want to wish you a very Merry Jesusmas! I know it has extra syllables, even for those of us who are from the south–but if you get a running start with it, you can make it fit in most of those songs that offend some people. Well, if I can’t change the name legally, then why can someone else? At least I left the “mas” in my revision; they aren’t suggesting Happy Holidaymas. When is the last time you asked someone if they accepted a Holiday as their personal Lord and Savoir? If you don’t like Jesusmas, you are not alone. My spell checker wants me to change it. Add it to the dictionary…argument over. Maybe there should be a Sanity Clause in all of this legal mumbo-jumbo. While we celebrate the birth of Jesus Christ on December 25th, and many are working to remove reference to Christ from the day of celebration, let’s look to the Bible to see what information we can get about the birth date of Jesus Christ. Many Christians acknowledge that no one knows the exact day Jesus was born, but the Bible gives us some good information about the event. The exact date of Jesus’ birth is not as critical as not losing focus of the greatest gift given to mankind. Let’s look at the series of event recorded in the book of Luke, and break it down into a time frame. We see from this passage, Zechariah, the father of John the Baptist, was serving in the course of Abijah in the temple. The “course of Abijah” was a specific time when priests served in the temple. King David had divided the sons of Aaron into 24 groups (1 Chr 24:1-4). This would set up a schedule by which the Temple could be staffed with priests all year round in an orderly manner. Lots were then drawn to determine the sequence in which each group would serve in the Temple (1 Chr 24: 7-19). Zechariah served in the course of Abijah, the eighth course, which started in early June. As we continue exploring the timeline in Luke, we see the angel announcing the birth of Jesus, to Mary six months later. The Jewish calendar was different than the one we use today, but this would have been sometime around our December, when Mary conceived. If I was teaching this in a classroom environment we would dig deeper into this, but this is not a course on calendar conversion. We know this was six months after the conception of John, because the angel told Mary that fact. Assuming that both Mary and Elizabeth were normal in terms of length pregnancy, John the Baptist would have been born in March, and Jesus probably sometime in the month of September. The Bible also gives more evidence that Jesus was not likely born in December. Shepherds were not in the fields in the winter, they were in the fields early in March until early October. This would place Jesus’ birth in the spring or early fall. It is also known that Jesus lived for 33.5 years and died at the feast of the Passover, which is at Easter time. He must therefore have been born six months the other side of Easter – making the date around the September/October time frames. Palestine is very cold in December and much too cold to ask everyone to travel to the city of their fathers to register for taxes. This would also support the evidence of the shepherds being out in the fields. If Jesus started His ministry at the age of thirty, as was customary for the Jews (Numbers 4:3) and was crucified at the feast of the Passover, which is Easter time, then He was about thirty-three and one-half years old. Six months the other side of Easter would make His date of birth around the September time frame. Regardless of when Jesus was born, our hearts should be filled with thanksgiving that God chose to send his Son into the world for our redemption and salvation. I hope this information does not ruin your Christmas, but makes it more special. If you have not received this gift of Christmas (eternal life) you can do it now and make This Christmas the best ever. The gospel does not require the celebration of Christmas, but there is no time that is “off limits” for us to meet together to celebrate the good things God has done for us through Jesus Christ. We celebrate Christmas in our home every year, but we are aware that the thing that is sacred, is the birth of Jesus Christ, not December 25th. If you look at the things I enjoy in life it would be easy to think I live in the past. I like Christian music from the eighties. I like automobiles that are older than I am. I like black and white movies and classic TV generation shows like I love Lucy. Nostalgia is big right now with a lot of people. Maybe there is a part of us that would like to go back in time to a place we think was simple. Was life as simple as we remember it? Would you really like to exchange your cell phone for the phone booth you can step inside of and close the door? Would you trade your computer for a typewriter? Would you miss your microwave and the hundreds of TV channels you can get? I hear people say about automobiles, “They don’t build them like they used to!” That part really is true. I have a 1929 Pontiac with 33,000 miles on it. In 1929 it was recommended to change the oil every 500 miles. The life expectancy of a car in 1929 was 50,000 miles. My Pontiac is not air-conditioned, and does not have power windows, although the windshield cranks open. An automatic transmission was not an option in 1929, but bumpers were. The windshield wipers work on vacuum, so the faster you drive, the faster they wipe. In a downpour, speed up! The Chevy I drive every day has 185,000 miles and still has not had its first tune up. People are right, they don’t build them like they used to, and the windshield does not even crank open. You may remember many good things that happened to you in the past. I look back at my past and the two biggest and greatest events I will ever experience happened there. In July of 1977 I married the love of my life, Victoria. The other major event in my life happened around November of 1981. That is when I met Jesus Christ and He revolutionized my life forever. Even though many good things may be remembered from your past, It can be dangerous to live in the past. So how can you know if you enjoy antiques and nostalgia, or if you live dangerously in the past? Do you find yourself thinking “If only I had done this.” or “If only I hadn’t done that.”? These are thoughts of regret you can do nothing about. Don’t beat yourself up over mistakes and regrets. If you need forgiveness, Jesus Christ offers freedom from your past. If you need to ask a person to forgive you, or to forgive someone, do it without hesitation. Don’t get caught up in the “if only” of the past. When those words pop into your mind, you can bet they will lead you in the wrong direction. You will tend to make more wrong decisions and be unable to remain clear minded. Those two little words will stop you from achieving what God has for you. When you look at the past, keep in mind all that Christ has done for you. Living in the past may not be as big of a problem for you as living in the fear of the future. Two more little words, “what if”, stop people from becoming all they can be. When you have thoughts like “What if I fail?” you may want to consider the reason. Many people suffer from what I call a “low spiritual self-esteem”. This is a condition that exists when we don’t see ourselves the way God does. Why would Jesus Christ die for you, then leave you to be on your own? Why would Jesus tell you to forgive seventy times seven, but use a different standard in His forgiveness to you? Once I was sitting on the shore of a lake, looking out across as the sun gleamed off the ripples on the water. The effect of the sun was like the twinkling lights on a Christmas tree, Illuminating, but for a second, then gone. As I looked out across the lake there were thousands of sparkles appearing and disappearing just as quickly. That is how a timeless God would see our lives. As a Christian, your life should reflect the Son to a world that is watching how we face our trials. We never know when that light reflecting the Son, will be called to the other side of eternity, and the people we come in contact with may not realize how short and significant life really is. Perhaps that is how we should see our trials. It seems like it takes forever to get through a trial, and the torment of the “if only” can become an extension to the pain. Whatever you are going through in your life right now, you don’t have to beat yourself up, and think back on a time when things were better or simpler. The past may be a great place to be from, but the present is where God has you at this time. As far as the future, anticipate what God is going to do in your life if you will yield to Him. Don’t try to tackle the problems of the past, present, or future alone. Let the grace of God sustain you as you walk through each day, and let the Son reflect a positive witness through your trust in Him.